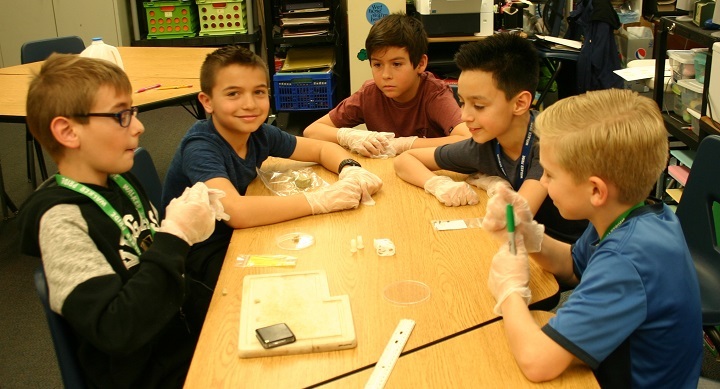 Five CCSD schools recently submitted entries in the Student Spaceflight Experiments Program (SSEP). The project allows students to participate in real world conditions to create an experiment to be tested in space. The five participating schools were French ES, Tomiyasu ES, Walker ES, McDoniel ES and Greenspun JHS. A panel of judges selected Walker’s entry as the one that will fly on a supply rocket in June and be tested on the International Space Station (ISS). The Walker ES project involves testing the germination rate of quinoa seeds in the micro gravity of the ISS. Pictured, left to right, are Walker ES students Hunter Dodds, Colin Brandel, Baron Petersen, Roman Medina and Spencer F. GATE Specialist Pam Locascio is the faculty advisor on the project.